©Bert Gildart: The month’s issue of Airstream Life features my story about extending the stage over which your RV will place you—by including kayaks in your adventures. 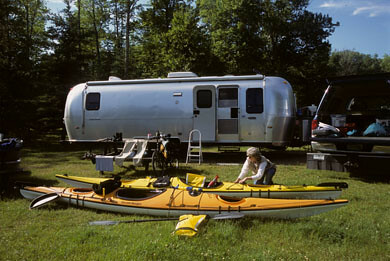 Kayaks and Airstreams are, in fact, a perfect combination, for both slice through the air while traveling. Streaming to our destination with our trailer, our sleek kayaks continue the work, drilling through waves and undertows—gliding past sunken ships or through wildlife sanctuaries; through lakes so calm you must critically study resulting images to insure proper orientation. We began our adventures with kayaks three years ago but did so with some practical preparations. First, we wanted information about the types of kayaks most suitable to our interest, and so we attended several kayak shows, eventually settling on two streamlined 17’ 10” sea kayaks made by Current Design. Then, we took courses on how to self rescue, something everyone must do! But we also took courses on how not to dump, using techniques such as the high- and low-brace. Then, I went one step further, taking a course in the Eskimo Roll—for it was my belief that if I mastered advanced skills I’d also develop the peripheral capabilities necessary to handle most any situation. To facilitate the learning I purchased several videos which provided instructional images on all the above techniques. Because Glacier National Park is in our back yard, we began putting our newly acquired skills to use on a remote lake in the park. Loading our kayaks onto the top of our pickup, we pulled our Airstream into a campground located on Lake McDonald, and then struck out early one morning for a daytrip to Kintla Lake. We arrived at 6 a.m. and at the time not a breeze stirred the water’s surface, and we kayaked the lake’s five-mile length. On our return the winds and waves rose and we put to use a number of strokes we had learned to insure stability. 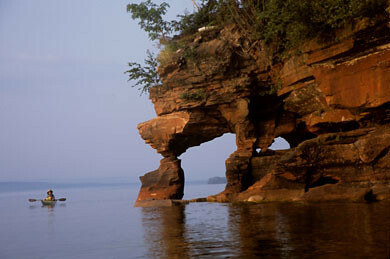 With increased confidence several weeks later we struck out for Wisconsin’s Apostle Islands National Lakeshore, located along Lake Superior’s southern shore. Kayaking the Apostles is one of the great attractions of this national lakeshore, and for kayakers, this is a must-see must-do destination, essentially because of the sea caves. Though you’ll find sea caves along the mainland of the Apostles, certainly one of the most interesting areas is Sand Island, located about four miles from the mainland. Sea caves rise from the water at various places and as they do they assume a variety of forms such as arches, fluted columns and deeply recessed caves. Time, combined with wind and water, carved these caves and the action still continues, as evidenced by the whoomping sound created by wave water suctioning away a veneer of particles from interior walls. Some of the caves had low ceilings, while others had high ones. Some we could actually enter and then place our hands on the overhanging rock and actually “walk” from one end to the other. Yet another area described in my story was Sleeping Bear Sand Dunes National Lakeshore located along Michigan’s Lake Michigan. Because of a wreck that projects high above the water’s surface the park was particularly intriguing. Though it is not easy to reach the remains of the Francisco Morazan, it is certainly worth the effort. From the mainland a ferry speeds you across Lake Michigan to South Manitou Island, and two hours later, we found ourselves erecting our tent at Bay Campground, a campground designated as “an entrance to the wilderness.” Three hours later, we were shoving off for the three-mile paddle along the shore of South Manitou. Four hours later, the wreck of the “Francisco Morazan” was in sight. 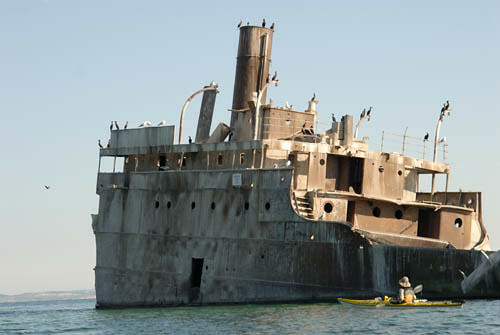 When you first see the old freighter, the huge ship seems an apparition; it simply doesn’t seem real. Sure you’re acquainted with tragedy of some form or other; most of us are. But because we’re so insulated from massive catastrophes, the sight of one, even a relatively old one, seems unreal. But there it was, the huge wrecked ship, and even from a distance, you know by the exaggerated list that something is wrong. The Morazan met her fate on November 23, 1960, when the captain, blinded by heavy snow squalls, the captain turned to the port and ran his 246-foot freighter aground on the southern shores of South Manitou, where it has remained for the past 47 years. The more you use your kayaks the more confident you become, and we have used them now in such diverse areas as Florida, Maine, Washington, and in both Nova Scotia and New Brunswick. As we travel our boats mount easily atop our Dodge pickup, which is a 4x 4 and sits high. So arranged our kayaks rise to just a few inches beneath the top of our trailer, which is 9 feet, six inches. That’s the way we traveled over 2,000 miles from Montana to Nova Scotia and New Brunswick, specifically to Fundy Bay, home to the world’s greatest tides as well as some of North America’s greatest camping and kayaking. Of course, you don’t have to travel so far to enjoy kayaking, but the point is that an RV loaded with kayaks make the perfect marriage, literally enabling you to travel further and stay longer. Not a bad combination in this time when gas prices are hitting the stratosphere. This entry was posted on Friday, June 8th, 2007 at 1:03 pm and is filed under Natural History/Conservation, RV Travel. You can follow any responses to this entry through the RSS 2.0 feed. You can leave a response, or trackback from your own site. 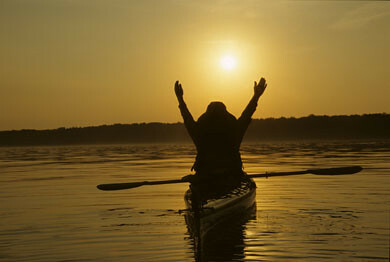 I can’t wait to go kayaking in the Muskoka Lakes this summer. I am going to visit my 97 year old aunt Mary Chenhall who has a cottage on Lake Henshaw.. 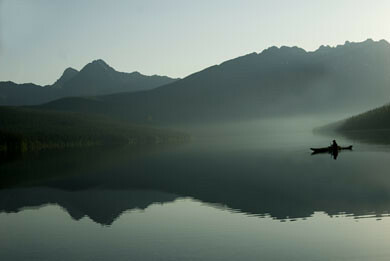 I love to kayak the calm waters. The scenery is so picturesque. The boat houses are huge. I will try for some pictures. I will be going June 24-28. My husband and I have just moved from Toronto to our cottage on the shores of Lake Huron near Tobermory, at the tip of the Bruce Peninsula. We have a two seater yellow plastic ocean kayak. Occasionally the clear turquoise waters calm down and we paddle forth to eye ball the gulls floating on the surgace. Most of the time the waves are whitecapped, suitable for surfing. But that is not the main reason I am writing this email. Mary Chenhall, a friend of my Mother, is alive and well and living in Oshawa now. She was up at her Henshaw Lake cottage for two weeks this summer no doubt presiding as the matriarch she is in her genteel way. I visited Mary at her cottage a few years back. I arrived at sunset. The space is so different from the wide expanses that we have here. Mary and I enjoy “talking cottage” immensely. Nancy, I hope you had a wonderful time when you visited Mary in June 07. If you have a chance, please contact me.